So wish I could keep this....Just the best Centre Piece..! 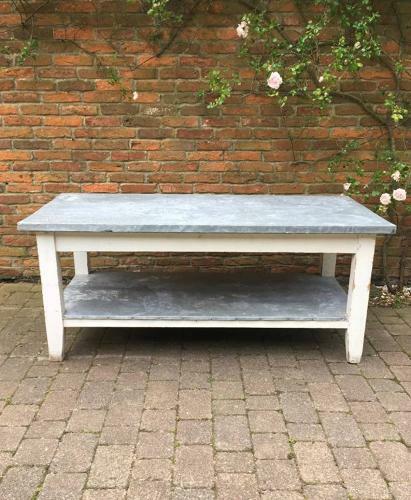 Edwardian all pine zinc topped work or preparation table...with pot board shelf under. The zinc is original - not topped as many are at the moment...this is the original zinc and the original paint. There are dings and marks on the zinc and the last photograph shows the pine showing through in a few finger tip size holes. All just as it should be as it has been used. The zinc would polish up but I have left just as I found it, in its complete untouched original condition. No worm in the pine. Collection or Courier. UK £65.